Some landmarks are just too beloved to lose. Imagine America without Mount Vernon or without Monticello. So why should Heartwood customers imagine life without The Barrington? In fact, you couldn’t—so back by popular demand Heartwood’s landmark home of the highest distinction returns in all its glory, now in rugged cellular PVC with solid copper roof, post pocket mount and eight luxurious nesting compartments. 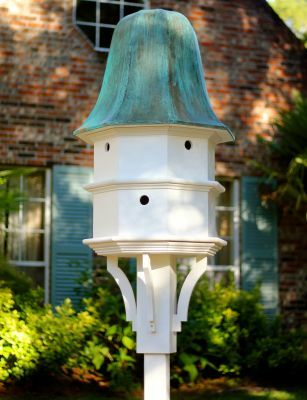 Birds will flock to see the sight, but they’re sure to settle in to sing your praises. Dimensions: 24"x24"x57" Hole: 1 1/2"
Heartwood birdhouses are crafted in the USA. Cellular PVC is completely synthetic and maintenance free wood substitute. It will not absorb moisture, crack, split, warp, delaminate or rot. You have the rich appearance of wood with none of the maintenance issues related to painted wood. It maintains a “like new” appearance in all types of weather. Cellular PVC requires no paint for protection or appearance. It also resists wood-boring insects, freeze/thaw cycles and high humidity.